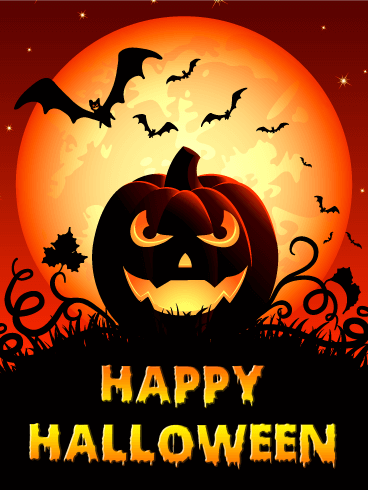 Once known as All Hallows Eve, Halloween is a night for scares, screams, and shakes. If you have a friend who loves the creepy elements of Halloween, send the leering, frightening Jack o' Lanterns and hissing cat on this fun Halloween card to celebrate their favorite holiday! They will be delighted to receive the scary Halloween wishes on this card! Every October 31, children, teenagers, and adults find the perfect costumes for their Halloween celebrations. As night falls, the streets fill with costumed celebrators who search for treats and goodies on this fun holiday. 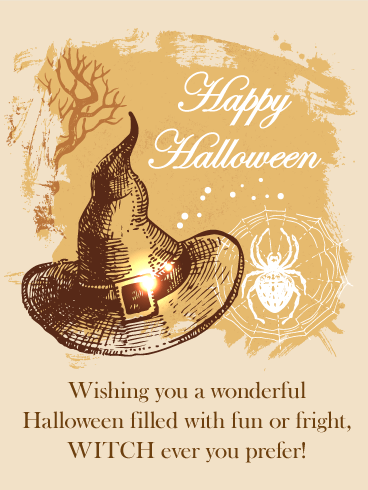 Just like Halloween night, this Halloween card uses the famous phrase "trick or treat" to celebrate this night of fun! 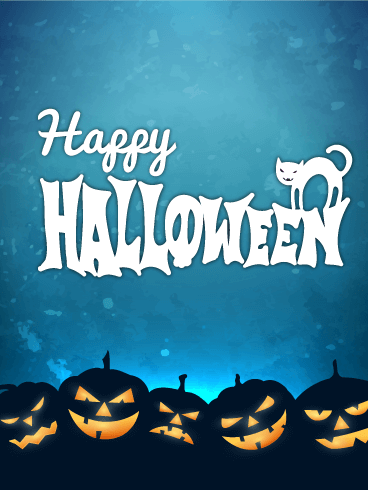 Give your own treats by sending this card today! Everyone knows that black cats are symbols of superstition, bad luck, and spine-chilling omens. On Halloween, a night filled with spooks and fright, scary cats fit right in. 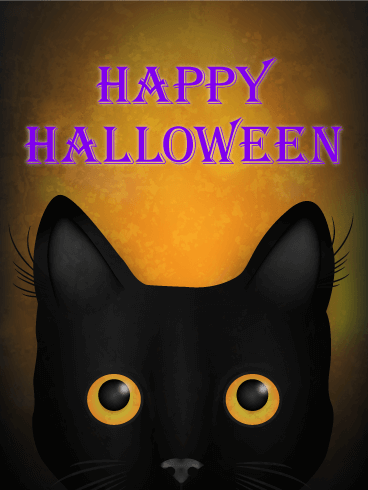 Though the black cat on this Halloween card looks cute and cuddly, it is the perfect decoration for a creepy and fun Halloween card! 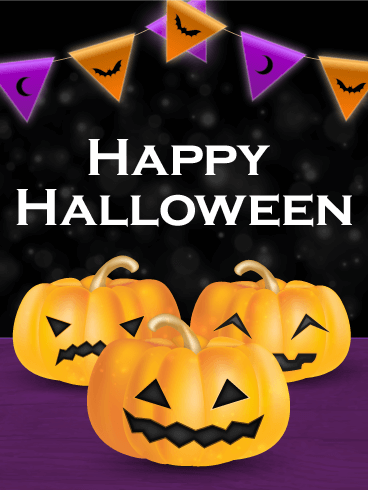 Create your own tricks and fright by sending this Halloween card to everyone you know! All parties are better with balloons and a Halloween party is no different! This bright and fun Halloween card is filled with sparkling confetti and orange balloons, a color that brings pumpkins, candy corn, and fiery cauldrons to mind. 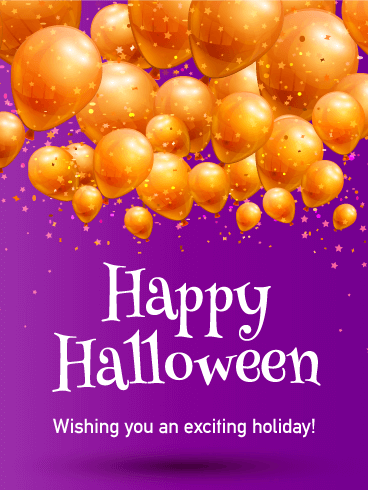 By sending this exciting Halloween card, you can give Happy Halloween wishes that will encourage holiday celebration and fun for all! With myths about werewolves, witches, and sorcery that prevail during Halloween, the full moon develops a spooky quality during the month of October. Like all good Halloween celebrations, this Halloween card displays a full moon that is surrounded by bats, Jack o' Lanterns, spiders, and cobwebs. 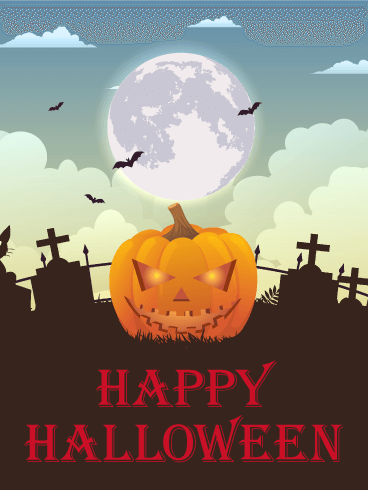 Share the scary fun displayed on this Halloween card by sending it to everyone you know! 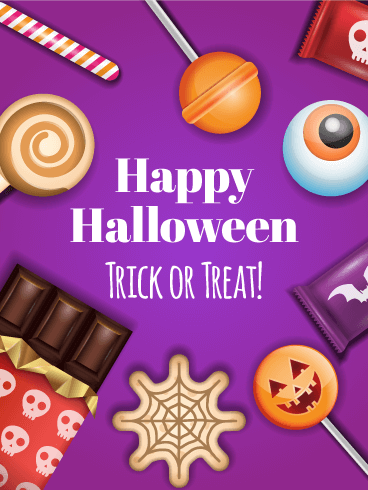 Though Halloween is filled with tricks and spooks, it's also a celebration of fall and fun. 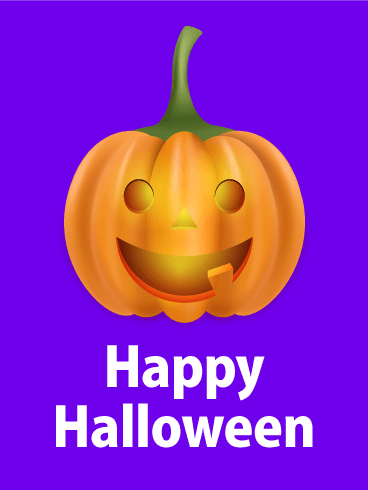 Carving pumpkins is an exciting activity to celebrate this holiday, so send your Happy Halloween wishes with the cute Jack o' Lantern on this Halloween card! The bright colors and gap-toothed grin will make this the best Halloween card they receive this year! What is scarier than a graveyard? A graveyard visit on Halloween with bats and a full moon in the sky and a terrifying Jack o' Lantern among the tombstones! 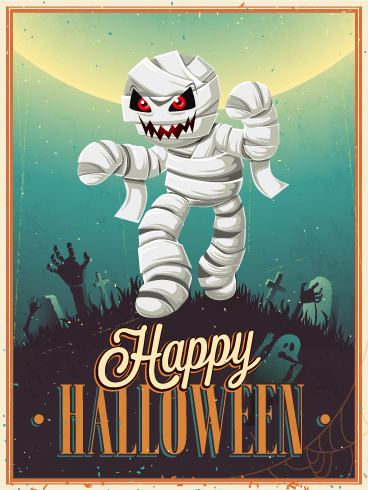 Halloween is creepy by itself, but this Halloween card shows all the terrors that can make the night even spookier! Scare your friends and family with this frightening Halloween card today! Do you enjoy throwing parties for any occasion? Are the gatherings planned for every holiday your favorite part of the season? 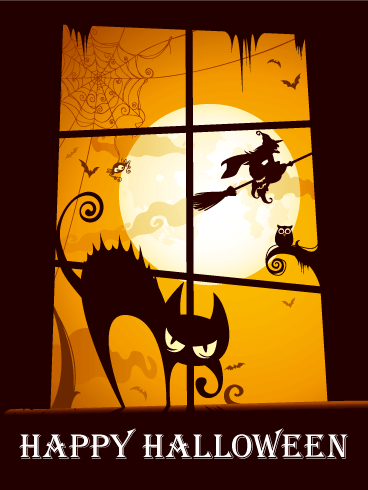 Then you have found the perfect Halloween card to celebrate the autumn holiday! 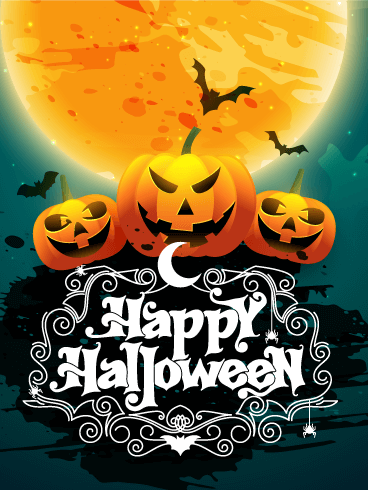 This Halloween card shows elements of a great party, with Jack o' Lanterns, spooky banners, and Halloween-themed colors. 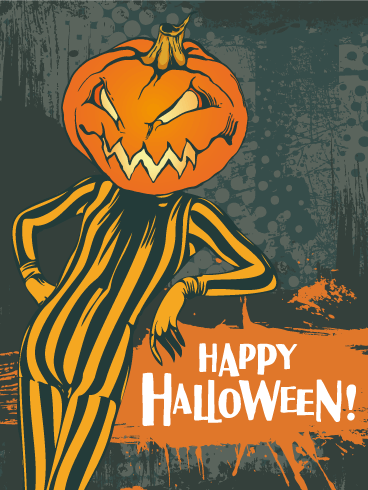 With this great Halloween card, your holiday celebrations are sure to be the best!